When people I know are about to visit the Netherlands or move here, they invariably express concern about the weather. I, also invariably, address their worries with the same optimistic piece of advice. It’ll brighten up, because our Dutch sky clears up just as suddenly as it had clouded over. Over the course of a single day, they are to expect a panoply of meteorological phenomena ranging from heavy rain to uplifting sunshine. Lately, though, this optimism of mine is in sheer contradiction to the endless succession of monotonous, bleak, gloomy days. So gloomy that even outdoorsy types like myself search high and low for interesting ideas on how to spend time inside. Well, how about The Dutch Navy Museum? 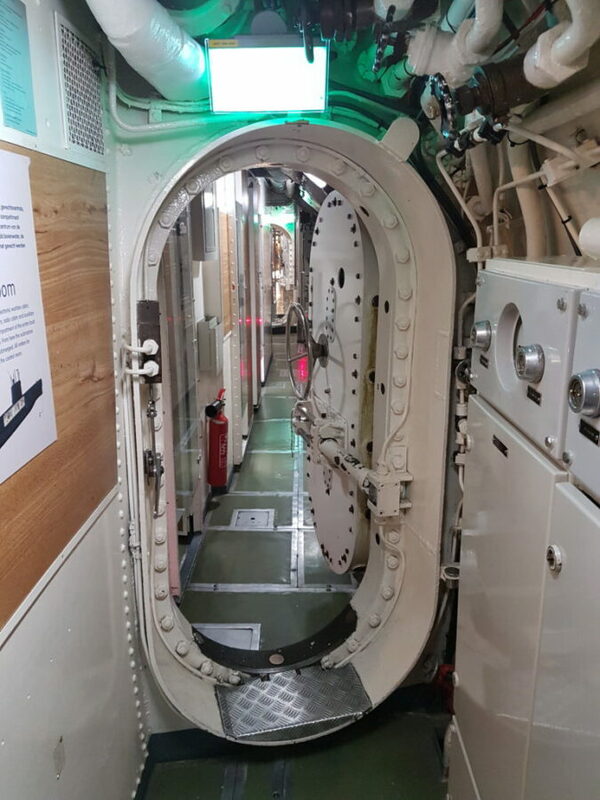 The HNLMS Tonijn (yes, Tuna) submarine is the pride of the Dutch Navy Museum in Den Helder, home port of the Royal Netherlands Navy. 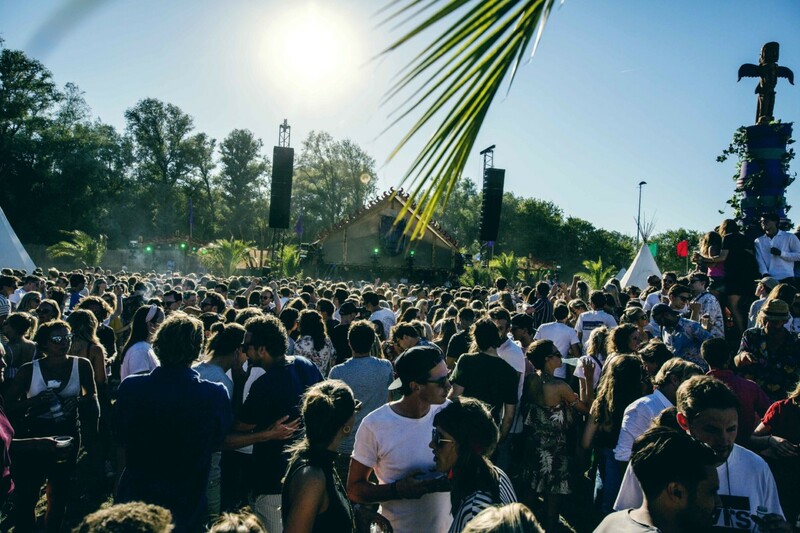 Located right next to the Texel Island ferry terminal, it is an eye-catcher, hard to miss. Granted, it is not yellow, nor is it any longer submersed in a sea of green, but it stayed in service for 25 years, survived serious trouble and is now beautifully preserved as part of a well-designed military museum, with very friendly staff. HNLMS is the international prefix for Dutch Navy vessels. The acronym stands for “His/Her Netherlands Majesty’s Ship”. The Dutch Navy itself uses, as prefix, either the Zr. Ms. (Zijner Majesteits, His Majesty’s) when a king is on the throne, or the Hr. Ms. (Harer Majesteits, Her Majesty’s) when a queen is. The Dutch submarine fleet currently consists of four Walrus-class submarines, all built in Rotterdam by RDM (Rotterdamsche Droogdok Maatschappij) and commissioned in the early 90s. HNLMS Walrus, HNLMS Zeeleuw, HNLMS Dolfijn and HNLMS Bruinvis. Tame names, I couldn’t help but notice, an amused smile on my face, as opposed to Russia’s Tiger or Gepard Akula attack submarines. The Dutch government has already allocated funds for complete replacement of the Walrus-class submarines by 2025. The decision regarding the provider of next-generation vessels is due early 2019. It is also in 2019 that women are expected to join submarine crews in the Royal Netherlands Navy. A pilot project, which requires operating changes to submarine living quarters, such as adding shower doors and changing room curtains. To start with, four women will join the crew of HNLMS Zeeleeuw. Kudos to these tough, trailblazing ladies, who deserve our respect and all the support they need. 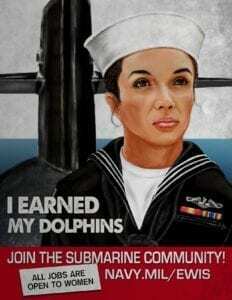 For what it’s worth, female officers have been serving on US submarines for 8 years already. In April 2010, the US Department of the Navy authorized a policy change to allow women to enter the standard nuclear submarine training pipeline. The first group of U.S. female submariners completed the training and officially reported on board two ballistic and two guided missile submarines in November 2011. What does the Tonijn consist of? Unlike its successors, the Tonijn is a Potvis-class submarine. It was built around the three-cylinder principle, a concept developed by Dutchman M.F. Gunning, which improved stability, allowing for deeper dives. The top cylinder consisted of the living quarters. The two bottom cylinders contained the diesel motor, as well as the electric motor and its battery. It was laid down in 1962, at the Wilton-Fijenoord shipyard in Schiedam, which is now part of the Rotterdam metropolitan area, and commissioned in the Dutch Navy four years later, in 1966. The crew consisted of 67 members: a commander, 6 officers, 13 petty officers, 20 corporals and 27 members of crew. If necessary, it could be increased to a maximum of 71 persons. They were divided into two teams, with one half working for 6 hours, while the other half would rest. 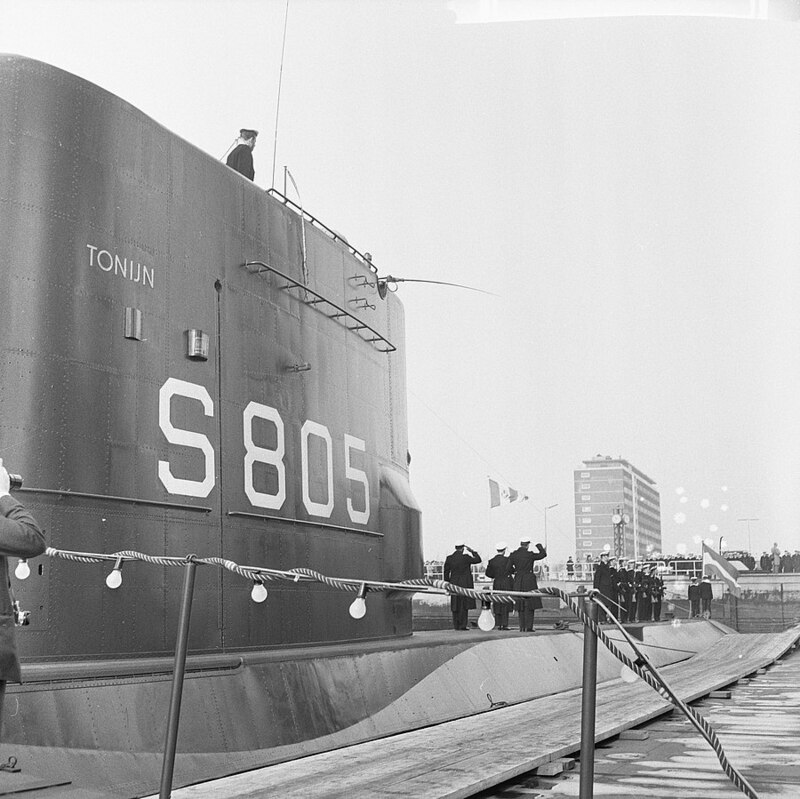 The primary purpose of the Tonijn was to combat Soviet submarines. It could evade detection by making little noise and was therefore suitable for collecting data on ships of the Warsaw Pact. Secret missions were carried out in the Mediterranean and the Arctic seas. A former commander of the Tonijn, Koen Hermsen is one of the main characters in Jaime Karremann’s new book, “In het diepste geheim” (“In the deepest secrecy”), published in June 2017. 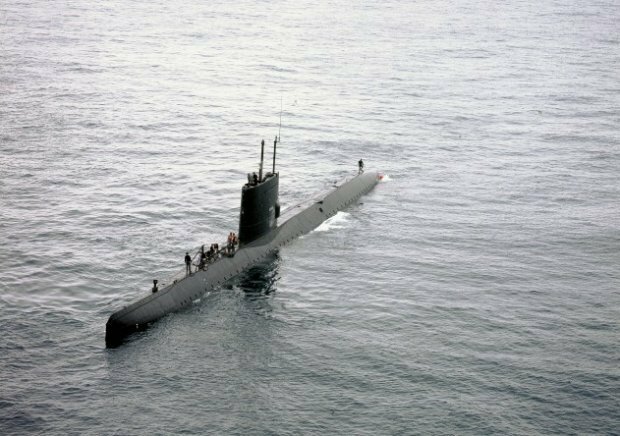 The book gives an account of the secret operations of the Dutch Submarine Service during the Cold War. In an interview in Dutch media, Mr. Kermsen affectionately recalls his service on the Tonijn – one of his best memories, as he puts it. He admits to returning to the submarine, now a museum piece, to get a sniff of that familiar diesel again, the smell that always triggers a trip down memory lane. In September 1979, the Tonijn experienced an almost fatal fire on board. It was left with 10% battery power because of battery depletion and had to be assisted by USS Harlan County, which towed it to Gibraltar. 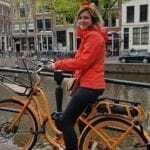 Repair work was undertaken in Rotterdam and completed by the end of the year. The boat went back to sea and stayed in service until 1991, when it was decommissioned. 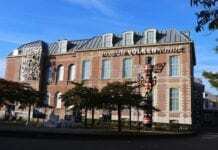 It was open to public, on the premises of the Dutch Navy Museum, in the summer of 1994. We visited the museum on a dreadful January day, freezing and windy – and almost had the museum all to ourselves. It might be tempting to plan a stop-over at the museum before embarking on the Texel ferry, on a warm Dutch summer day. I would pick another time, though, because it looked pretty crowded when we drove past the Tonijn, in summer. Being squeezed against other people in a hot metal can is not my idea of fun. I bet it’s not yours either. We started with the main building. This is where you get your tickets and also where the souvenir shop is located. 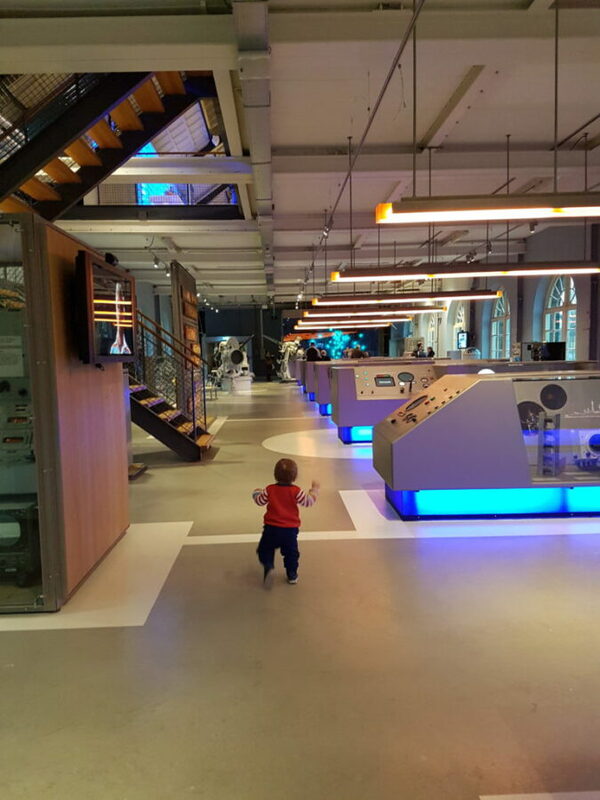 Two floors of technology, history and know-how. A small elevator is available, on request, for strollers and wheelchairs. 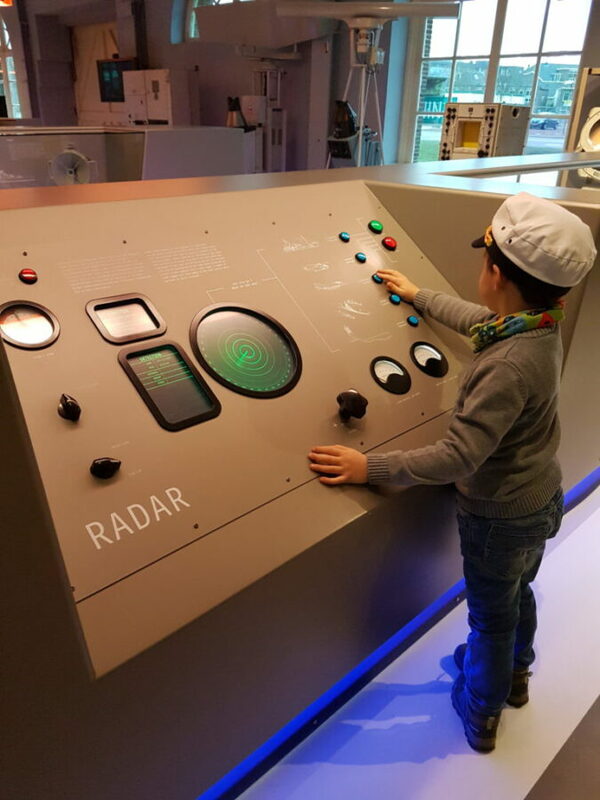 We spent more time here than initially expected, with my five year old trying to grasp concepts such as radars, sonars and transmission encryption. He glued himself to the sonar interactive board, where he made guesses, over and over again, about which signal corresponded to a submarine, a whale, a school of fish or an underwater mountain, respectively. It was entertaining and educational. Eventually, we headed to the submarine. 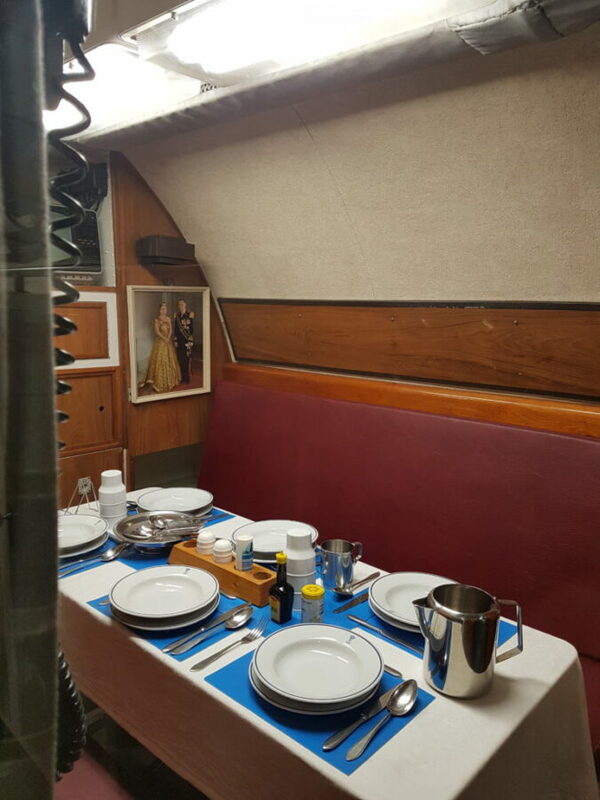 There is museum staff on board, a single attendant when we visited, so not too intrusive. Ready, eager in fact, to answer any questions you might have. 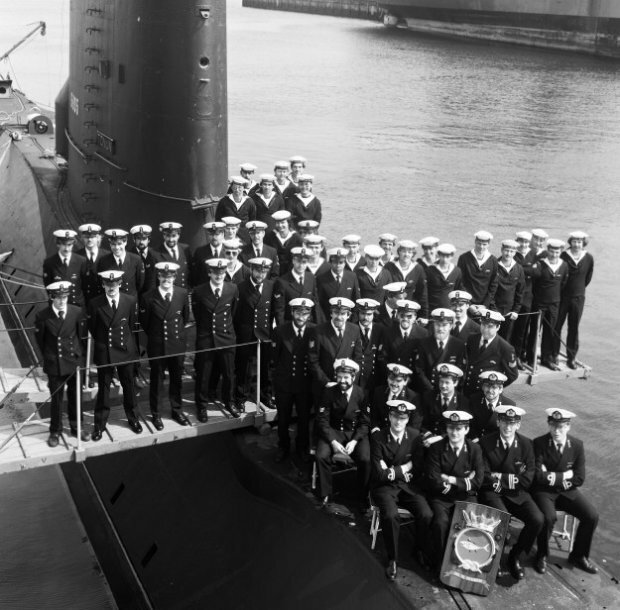 According to the museum website, many of these attendants have actually served on a submarine of the same class as the Tonijn. Plenty of equipment and, for kids, lots of buttons to push. My son was most excited about the periscope, which he could easily tell apart from the rest of the intricate, albeit outdated, systems. 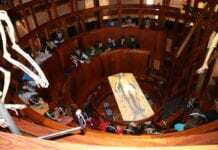 Predictably, I was fascinated by the living space. 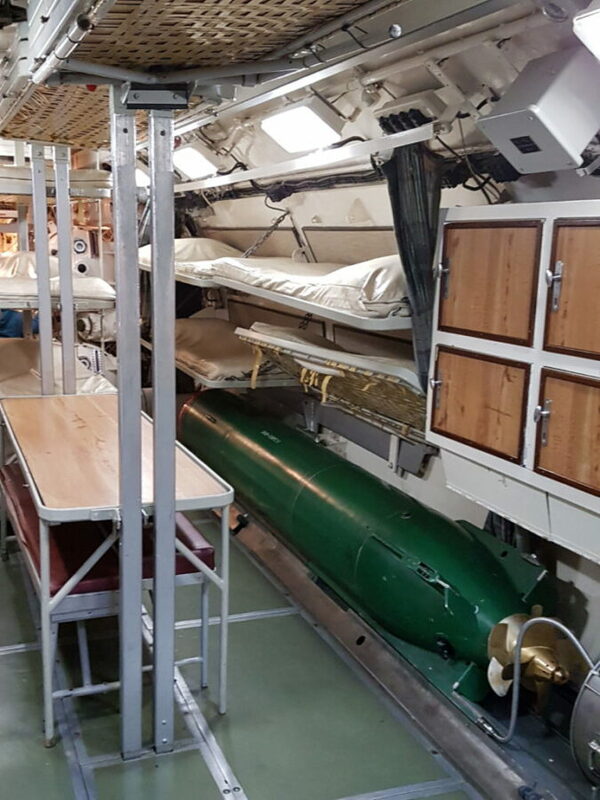 The officers’ wardroom, the commander’s cabin, the crew beds less than a meter above the torpedo. 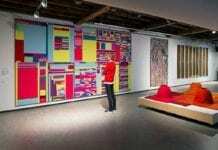 Everything has been carefully preserved and is beautifully presented. The table is neatly laid. There are open face-down books on the table. There is a photograph of the queen and her consort on the wall. It makes one wonder what life used to be like on board. And, of course, what modern, present-day submarines look like. Despite the very strong wind, we felt adventurous enough to climb onto the submarine roof. We barely survived. There was one last museum highlight, the bridge and 3D radar of the HNLMS De Ruyter F806 guided missile frigate. No more than half an hour left for it, before closing time, which was a pity considering how interesting and fun it was, for adults and kids alike. 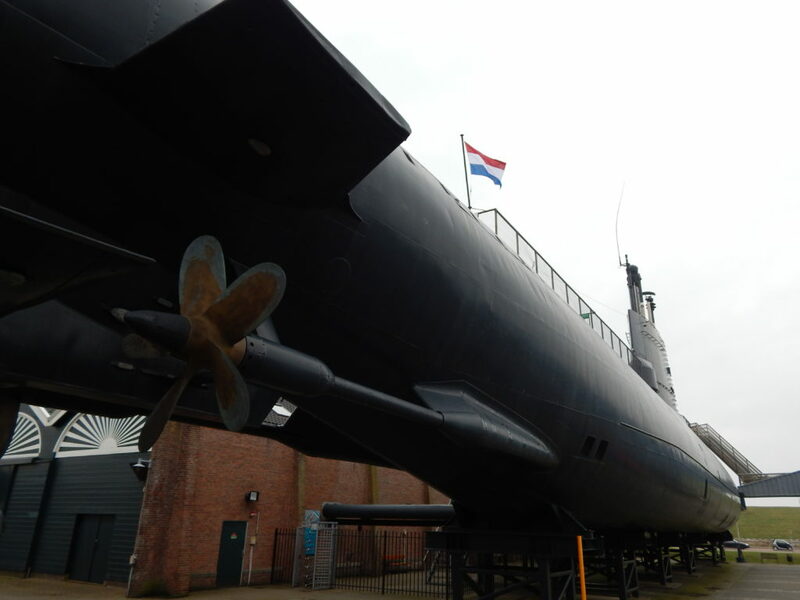 The Dutch Navy Museum in Den Helder is free with the museum card (museumkaart). If you are even remotely into navigation and/or warfare history, then this is your cup of tea. 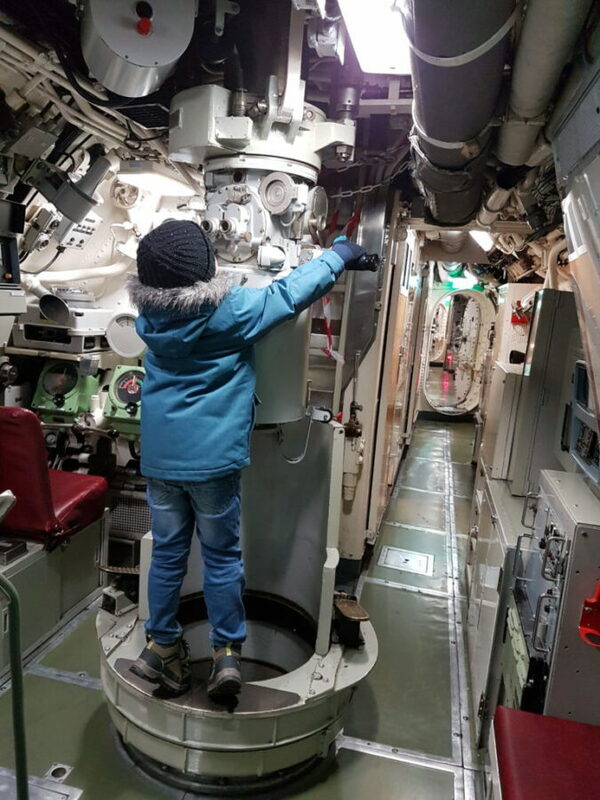 If you have kids and there is at least one toy submersible lying on your living room floor, take them there on a day out to the Dutch Navy Museum. They will jump up with excitement. Now that you’ve read up on the Tonijn, you’ll also be able to walk them through the historical context. And, of course, surprise attending staff with smart questions. Wink, wink. 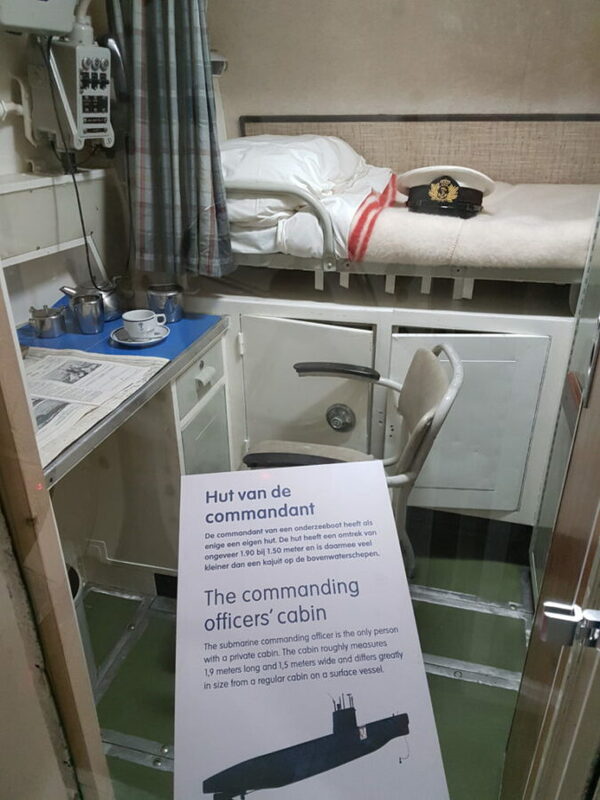 Have you ever been to the Dutch Navy Museum? Let us know in the comments! Previous articleCalling all chocolate lovers: A Tony’s Chocolonely factory is coming to Zaandam!